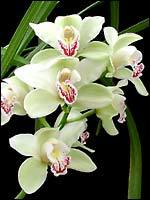 Once cymbidium orchids have finished flowering it's the best time of year to tidy them up and prepare them for their new growing season. Take a good look at the orchid and see if the clump is crowded enough to need dividing. Sometimes this decision is easy: the clump of bulbs is so full that it's literally bursting out of the pot. Or there are so many dead bulbs in the pot that the plant can only benefit from their removal and being given the chance to make a fresh start in new orchid mix. Remove the plant from the pot. Sometimes it may even be necessary to break the pot to free the orchid. Take a knife or another strong tool and use it to lever between the bulbs. Separate the clump into at least two sections. Remove most of the leafless, dead-looking bulbs, although it's wise to leave a single row of these back bulbs next to the leafy shoots. Check the roots for damaged, rotted or tangled sections. Remove these. Choose new pots that have plenty of drainage holes - good drainage is critically important for orchids. Pack some orchid mix into the base of the pot. Sit the orchid in the pot and fill around it with the mix. Make sure that each bulb is sitting above the mix. Water well and sprinkle some fertiliser on top, such as Bio Gold pellets. Feed with orchid food every two weeks. After Christmas, use a fertiliser such as Yates Thrive Flower& Fruit Soluble Plant Food fortnightly to encourage flowering. Remember, though, that after orchids have been divided, it can take two or three years for them to reach flowering stage again. White, sometimes fluffy, mealybugs cluster on stems and in leaf bases. Snails and slugs eat holes in leaves and flowers. Sprinkle snail pellets at the base of the plant. If pets are around, place pellets in a pet-proof container. Spotted leaves and poor growth caused by viral disease. Best to remove and destroy affected plant. Give plants more time to mature. Feed with a fertiliser such as Thrive Flower & Fruit Soluble Plant Food. Make sure plant gets morning sun during autumn and early winter.